Cricket Crystals are made of a safe product called Anionic Polyacrylamide, which is the same stuff used to make the cricket water type products in pet stores. 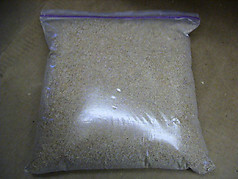 We are selling you the dry crystals for making your own chucky cricket water. You can make if for your own insects, or for resale. Totally Safe for humans to touch! 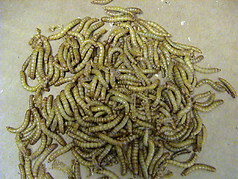 Try Worm Man's Cricket Crystals for making your own cricket drink chucks. This will make the same stuff that you buy at the pet store or online, but at a fraction of the price. How Because we are offering it in crystal form. All you have to do is add water and watch as the crystals absorb the water and become water gel. Each package makes one gallon of gel. We will enclose directions so that you can make a little at a time or a whole gallon. No more messy sponges and water dishes in your insect cage! No more fungus and mess! Can be used for crickets, mealworms, superworms, Roaches and other insects. Includes complete instructions. Perfectly safe for feeding insects that will be fed to reptiles. Do not feed Cricket Crystals to reptiles because it will fill them up and they will feel full and will not eat, and may become malnourished. Only feed to insects! 1 packet makes one gallon when hydrated. Shipping Free!! 1 Packet $4.95 prices include shipping! Wholesale 50 Packets carded with UPC for resale. $59.95 Shipping Free!